Okay, so... I know I've done the whole... broiled grapefruit thing, which is pretty amazing. But, as I've found out, there are actually a lot of people out there that cannot enjoy grapefruit for one reason or another. Yes, even a few in my own family! Now, I looove peach season. I think that I may have mentioned that once or twice before. So naturally, I've been waiting rather eagerly for the prices of peaches to go down and huzzah! It finally happened this last weekend! I rather enthusiastically plucked a few gorgeous ones up and immediately began planning. Though... I pretty much knew exactly what I wanted to try. 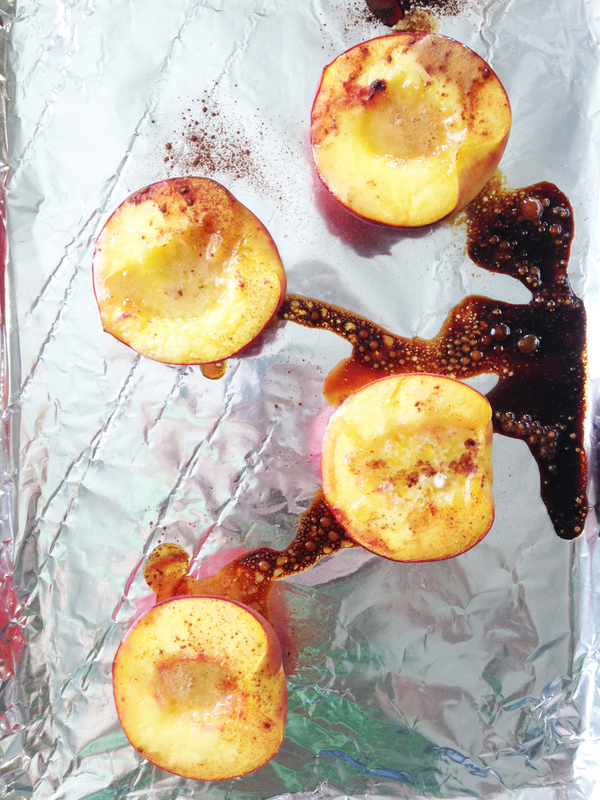 Honey roasted peaches! These lovely little things are light and tart enough for a breakfast, but sweet and decadent enough to pass for a rather guilt free dessert as well. Now, my peaches were still a little firm and not quite ready to be eaten. So they still had a bit of a tangy note to them. The more ripe your peaches are, the more sweet this treat will be, so be sure and keep that in mind! What makes this even better, is that these are so easy to make and are completely worth heating your kitchen up in the summer time for. Though... if you wanted to offset that and keep things cool, you could always freeze the vanilla yogurt ahead of time as a make-shift ice cream!